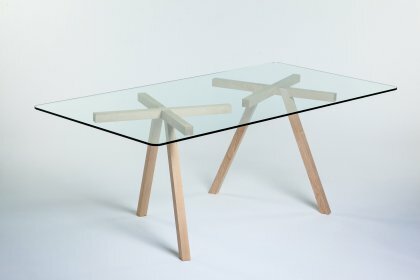 The object pAAr (a pair) by Tibor Weissmahr actually only works in a pair: it is a pair of trestles for a table. It might not seem unusual that trestles only function when paired – they always do so. Nevertheless, this pAAr is characterized through the fact, that it does not only fulfill its duty when underneath a table plate, but also because both trestles effectively can only stand when fixed in this position, otherwise only leaning or lying. And this is due to their unusual construction: first of all, they each only have two legs, forming an upside-down V. Secondly, they own a far reaching area of support – a cross or a circular surface – that centers in exactly the V's summit. 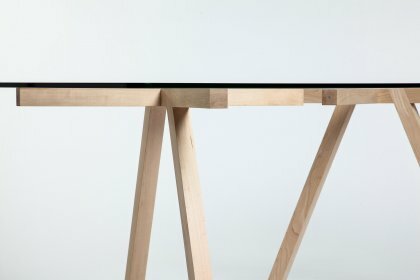 Therefore, pAAr's bearing does not consist of a linear connection between two table-legs, as common, but of a relatively large symmetrical surface onto which the table top is positioned. 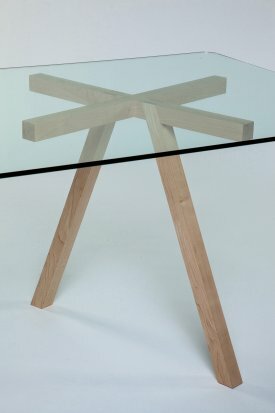 Once this happens, a "physical reaction" so to speak takes place: through the table plate's planar configuration and weight – optionally made of wood, glass, metal or whatever else – the bearing surface and at the same time also the trestle pair carrying the surface is adjusted: the table stands perfectly.